The day before I saw WARLOCK I heard it described as one of the greatest American Westerns no one knows about. The piece described it as a film in desperate needing rediscovery. The Overlook Encyclopedia of Westerns calls it the second greatest western behind Johnny Guitar. That’s high praise- I’m not sure the film lives up to it- but it’s still a good film. 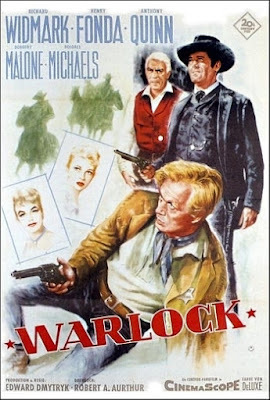 The film has the town of Warlock under siege by the cowboys from a nearby ranch. Because the owner is the big cheese his men feel they can do what they want. Since they are far off from the county center lawmen are scarce. 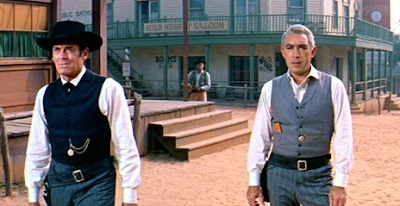 In desperation the town hires Henry Fonda a legendary lawman at 4 times the going rate. Fonda comes to town promising change and with his friend Anthony Quinn in tow. 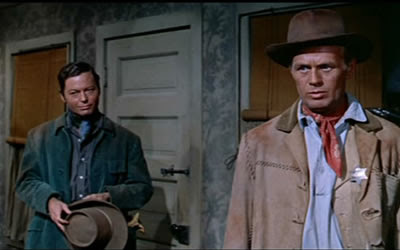 Drifting between the two groups is Richard Widmark, a cowboy with a strong sense of right and wrong and a healthy dose of loyalty. One of the grayest films you’ll ever see, this is a film that is very much like the Widmark character that drifts all over the place as it tries to work out who is good and who is bad. Everyone is both less and more than they seem. Everyone does and has done bad things as well as good things. You really can’t root against anyone because everyone is flawed. It makes for an interesting viewing experience especially since westerns tend to be either black or white. The only one who embraces the uncertainty is Widmark who is actually the center, moral and story wise, of the whole film. His drift from on the lawless side to the that of the law is the journey that the audience and the town takes. Of note is the relationship between Fonda and Quinn. While it is not openly gay, there is no mistaking that’s what it is. While both men have relationships with women, it is the relationship between the two that is most important. Even if they are not a couple, they are in fact one. I have to applaud the fact that it’s there and that no one really cares. If you want a boundary breaking western WARLOCK is the film for you.